Search for the best flight prices from Stansted Airport to Rimini. Compare prices, book today and save money with Stansted Airport. With a long history as a holiday destination, Rimini might be considered a hidden gem of Italy’s northern Adriatic coastline. Founded around 2,300 years ago by the Romans, the city was the home of culture and relaxation even in those days, as well as serving as a link between the north and south of the Italian peninsula. Today you may struggle to find a centurion but the city’s history has been well preserved and added to by several key figures of the Renaissance. Rimini also shows the touches of modernity with thousands of bars, restaurants and a thriving tourist industry making it a brilliant destination for a long holiday or just a relaxing weekend. As a major Italian tourist destination, Rimini has plenty of different hotel services to offer. You can find just about every type of accommodation in the city, including high-class spa resorts like the i-Suite Design Hotel or family hotels like the modern Ambient Hotel Panoramic. If you’re looking for a particularly good deal it’s worth looking a little further from the seafront as prices decrease away from the water’s edge. While it’s easy to fill your days sunbathing on the beach in Rimini, those who’d rather get a little retail therapy in will find there’s more than enough shops to keep them occupied. The city itself has lots of stalls lining the streets where you’ll be able to get good deals, however, if you’re looking for the absolute best prices there’s nowhere better than the Rimini Covered Market. Alternatively, you can enjoy the city’s American style mall, Le Befane Shopping Centre, where you’ll be able to find all your favourite brands as well as some local treasures. Food in Rimini is fairly standard for Italy, so pizza and pasta are the order of the day. However, the city does have a few delicacies you should try, including Piadina sandwiches which are made with salty Piadina flatbread for extra flavour. The Rimini region is also famous for its cheese, so be sure to try as many of the local varieties as possible when you visit. Sometimes called ‘summer new year’, Pink Night is held on the 1st of July and marks the start of summer with a huge firework display as well as a countdown to midnight on the 31st of May. There are plenty of pink night parties across the city so make sure you have tickets to one of them to make the most of the experience. Held mid-way through August, Ferragosto is a public holiday celebrated across Italy and especially in Rimini where tourists flood the streets to celebrate a day in the sun. The city jumps at this chance to show its best so you’ll find plenty of street performers and tours of the city’s ruins. 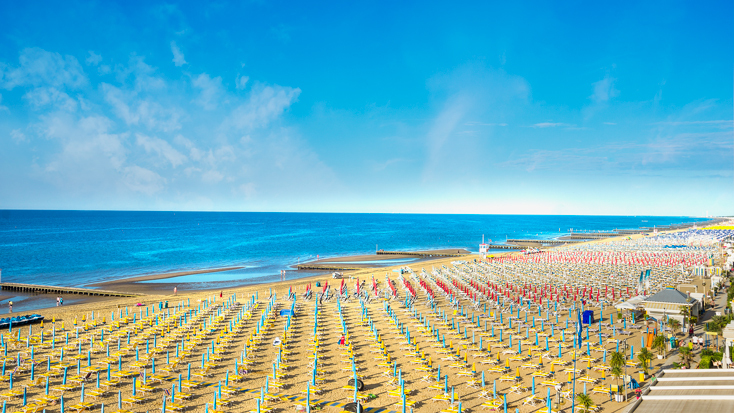 If you want to experience the very best of Rimini, visit during Ferragosto.